This was first featured on Space Wolves Blog in 2010 which is now lost to the warp. In an effort to retain the information we have republished it here. Grey hunters form the backbone of the Space Wolves army. These Grey Hunter tactics are going to explain the best builds for your Grey Hunter packs and demonstrate how to get the best value for your points. Grey Hunters are Blood Claws who have tempered their aggression with experience. Armed with a bolt pistol, close combat weapon and a bolt gun, they can fulfil a wide range of battlefield roles and are one of the most versatile troop choices in the game. Not to mention that they get an extra close combat weapon and Counter Attack for the same points as a regular Space Marine. This is the trade off for being unable to take a heavy weapon on break up into two separate Combat Squads like regular Space Marines. Space Wolves also do not have Battle Tactics to voluntarily fall back. As a close combat army, this kind of ‘tactical thinking’ is unheard of! As the core troops of your Space Wolves army, these units should be able to do anything. They provide the staying power, the anti-troop solution and the anti-tank solution. It’s a difficult role to fulfil, especially when compared to other Space Marines. My friend James who plays Dark Angels (boo, hiss!) has got this down to a tee by splitting his Tactical Squads into Combat Squads. One team goes forward with a melta gun in a Razorback and gets stuck in, while the other team sits back in a defensive position with a lascannon. Grey Hunters don’t have that luxury. They take the role of the squad driving forward in the Razorback or Rhino transport. But this suits the up close and in-your-face nature of the Space Wolves. The only question is how many men and how many points you place inside that transport. Flamer – rubbish on a foot unit. Melta Gun – Essential for tank hunting and doesn’t prevent charging. Plasma Gun – Versatile, but cannot fire and charge. Power Weapon – Mark of the Wulfen is better. Power Fist – expensive, but good. Wolf Standard – brilliant! Always take one. Mark of the Wulfen – Better than the Power Weapon. Based on what other Space Marine armies pack into their transports, this squad has all the basic essentials: a melta gun and a Wolf Guard with combi-melta and powerfist for a boost in Leadership and some extra close combat clout that’s more points effective that equipping a Grey Hunter with the same wargear. For more on this, see Wolf Guard Tactics. Of course, you can swap the melta gun and combi-melta for a plasma gun and combi-plasma if you like. But when this unit will have to deal with every kind of opponent from light infantry to heavy tanks, the melta gun is the safest bet and considerably cheaper too. Why the Razorback over a Rhino? Because for 5pts more, you get a twin linked heavy bolter turret. It’s too good to pass up if you only need to transport 6 Space Marines. No one is their right mind is going to charge this, not even Tyranids. Okay, Tyranids probably will and carnage will ensue. 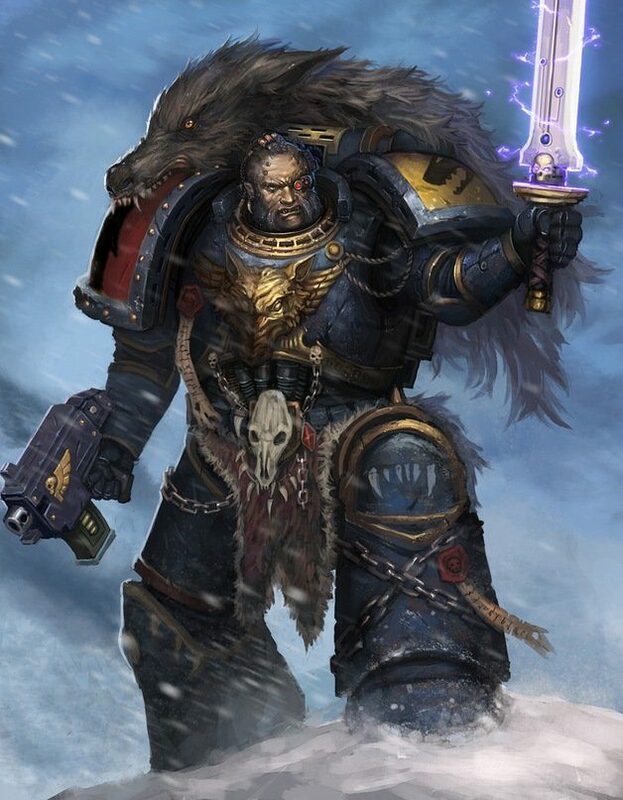 But with 2 powerfists, lots of basic attacks, a Grey Hunter with Mark of the Wulfen and a Wolf Standard, the Space Wolves should emerge triumphant. 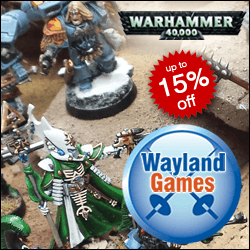 Why take Mark of the Wulfen over a Power Weapon? Statistically it’s better against basic troops and monstrous creatures, and if you roll a lot of 6s it’s amazing! Finally, a Wolf Standard has to be my favourite piece of equipment. Use Once Per Game. For the duration of the next Assault Phase, all models in that unit may reroll ANY dice rolls of a 1. So that’s rerolls to hit, to wound and pass armour saves. How good is that for just 10pts! If you want to put your Grey Hunters in a Drop Pod, simply swap the Rhino or Razorback for a Drop Pod. Simple! I’d never drop pod my whole army in 5th edition, because any player with a shred of sense will be able to easily counter it. But a single Grey Hunter squad joined by a Wolf Guard, Arjac Rockfist or an Independent Character in a Drop Pod creates a very dangerous deterrent for an opponent to start the game with most of his units on the board in a defensive formation. It’s a big leap from 168 points for a Troop choice up to 278 points. For roughly the same points, you could have 5 squads of the 6-man Grey hunter packs in the Razorbacks or 3 of the 10-man Grey Hunter packs in Rhinos. Either way, you’ve still got 30 men. It’s just a choice between more fire power in the form of 5 twin linked heavy bolters and more melta guns or more Power Fist attacks, more basic attacks and Wolf Standard re-rolls. All your eggs (Grey Hunter) in 3 baskets (transports) for 6 Kill Points or your eggs in 5 baskets for 10 Kill Points. My money is on the 10 strong Grey Hunter pack. 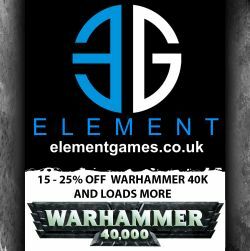 It can hold its ground, slug it out with the best of the 40K super units and if need be, fight its way through the enemy army, to claim and objective or cause massed carnage. The huge number of basic attacks are very impressive, as are the powerfist attacks to follow. Finish it off with a Wolf Standard to re-roll any 1s and very few of your Space Wolves should fail their armour saves. Also, the effects of the Wolf Standard apply to 10 Space Marines, not just 6 and that makes a very big difference! The other plus about taking big squads like this is that they can merrily foot slog it to towards the enemy should their transport be immobilised or destroyed, they can deliver a devastating Counter Charge and by taking 3 of these units instead of 5 of the smaller ones, you are giving away far fewer Kill Points.